Another malware attack, named GoldenEye (also named Petya, NotPetya and PetrWrap), spread recently. Petya is a family of encrypting ransomware that was first discovered in 2016. In June 2017, a new ransomware masquerading as Petya but actually named GoldenEye was used for a major global cyberattack, which utilizes the EternalBlue vulnerability previously used by WannaCry earlier in the year to spread. WannaPatch is designed to make it easy and fast to check if a Windows system is patched and, if not, to get the required update. Once a single system is infected with GoldenEye/Petya, it can spread inside a local network, even to previously patched systems. It is CRITICAL to have installed the needed patch (MS17-010) to all Windows systems. All versions of Windows on PC hardware may be vulnerable. Windows XP IS vulnerable, despite some fake news that have been widespread. It is recommended to check that your systems are not vulnerable and, if they are, to patch them as soon as possible. More flaws of the same type have been disclosed recently (EternalSynergy, EternalRomance, EternalBlue, EternalChampion, EWorkFrenzy) and some newer cyberattacks are expected any time soon. The good news it that some free patches exist for all these flaws and WannaPatch will detect if your system is vulnerable to any of them. And if so, it automates the download of the patch that targets your very system. No need to know any details about your system version or architecture, WannaPatch does it for you. We have created a very simple and free tool that can detect if a Windows system is vulnerable to the GoldenEye/WannaCry/Petya attacks and that can also, very easily, help you patching your systems in case they are vulnerable. And all that for free! Our tool has been run on 1914 computers so far! It detected 257 vulnerable systems, among which 18% were Windows XP systems. It was run 346 times during the past 7 days and 70 times during the past 24 hours. Download WannaPatch Regular: it detects if your system is vulnerable and if it is, it will help you downloading the correct patch for your system, very easily. You don't need to find out what patch to apply, the system does it for you! I wondered if I my daughter PC was vulnerable to the now famous Wannacrypt ransomware. I just didn't know how to do. With this tool, I could check the vulnerability and now I am reassured. My old (but perfectly working) Windows XP gave me cold sweat when I heard on the radio that old XP were targetted by a widespreading malware. I suspected that I may have to patch my system, but I could not understand what I had to do. I download WannaPatch, it ran quickly, detected that I was vulnerable and let me patch my system very easily ! Ouch! My work PC has been hit by the Wannacryptor malware. I was very annoyed not to know what to do with the computers we have at home (we have 3 of them). 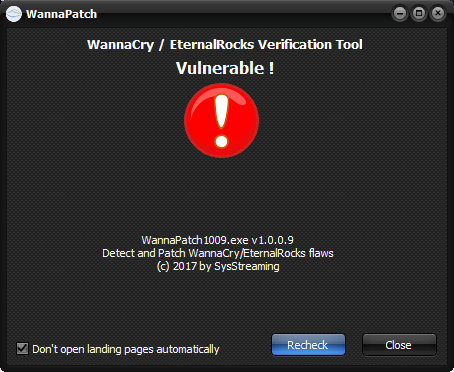 WannaPatch detected some vulnerability on 2 of them and now, thanks to this utility, they are patched ! My rich friends have Macs and just could not help me. Hopefully I found your tool and I feel safe now, knowing that my systems are not vulnerable.